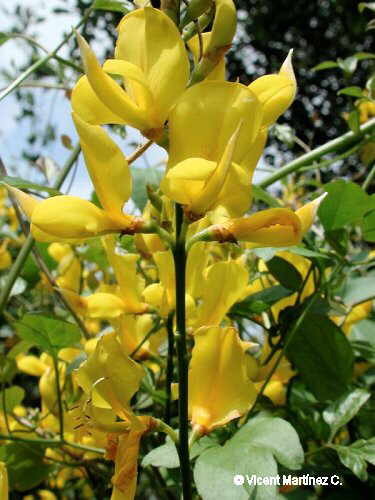 Perennial shrub of the Pea family -papilionaceae– up to 3 m. Numerous erect glabrous stems. Oblong-lanceolate or linear leaves, not very numerous on the stems, more abundant at the base. 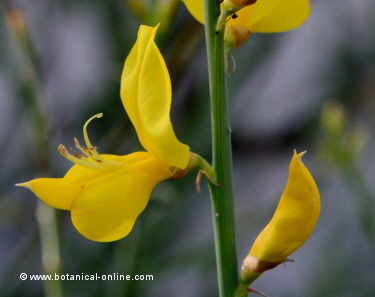 Big yellow flowers till 2 cm, in racemes at the end of the stems, scented. Fruit in legume, black in madurity. Native from the south of Europe, can be found in dry grasslands and margins, but it is also cultivated in many places as a garden shrub. Also by the side of the road to protect slopes from erosion.